Cook, Eat, Burrp!!! 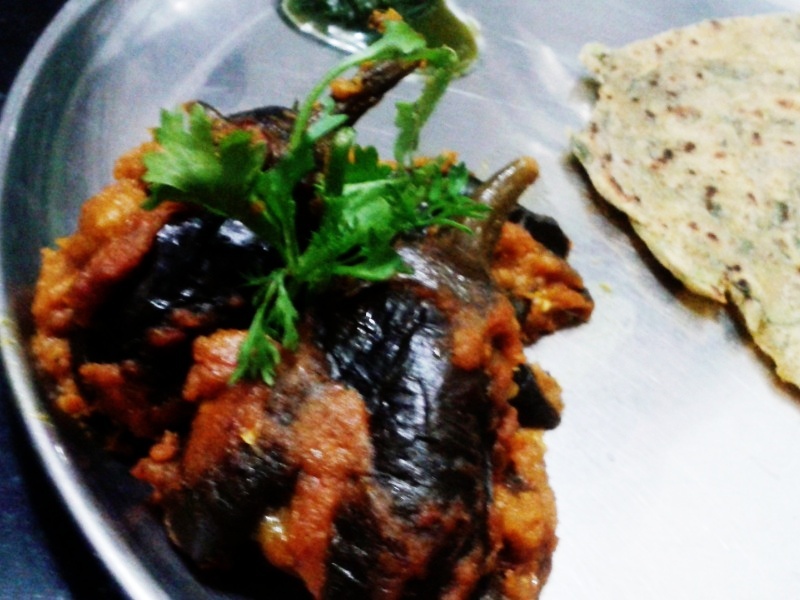 : Bharwan Baigan with a Twist! 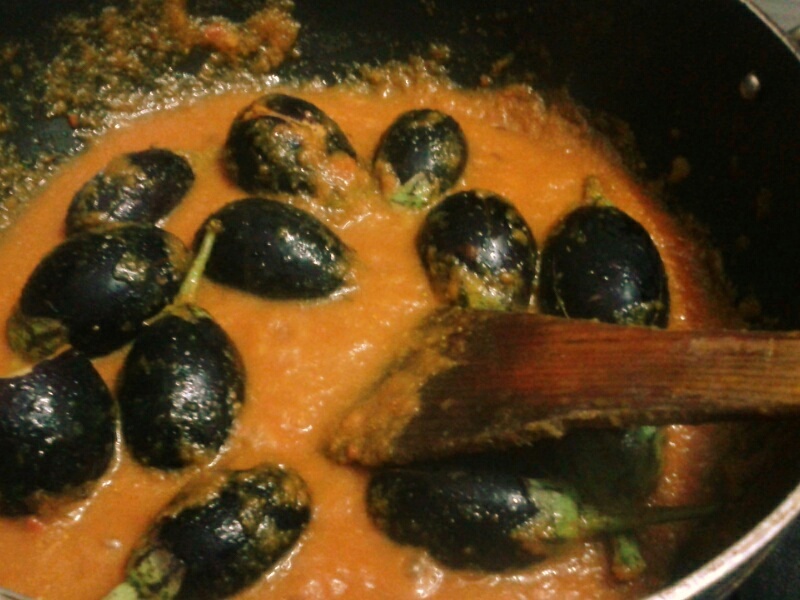 Bharwan Baigan with a Twist! A lot of thought went into naming this blog and between I & Hubby we came up with the weirdest names. 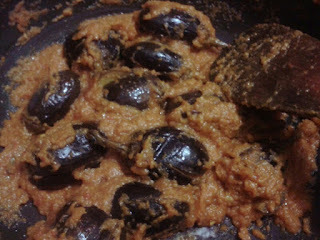 So here I am with the first recipe for this blog. Will try to move some old recipes lying in the other blog here as & when I get time. Also ignore the photo quality, I am hoping that the quality will improve with time and a little later the pictures themselves will tempt you to cook the dish immediately. Twist here is that instead of stuffing the baigan I have tried a shortcut to it. Oil: 2 TablespoonPut the onions, tomatoes, ginger, garlic & all the spices besides Garam Masala in the mixer grinder and make a fine paste. It is said that the finer the paste the faster it cooks. 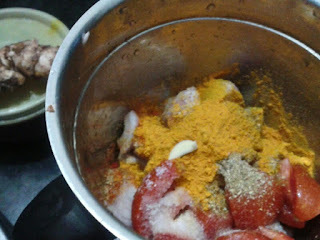 Pour the oil in a kadhai and once it heats up put the Masala in it, cover the lid and leave the gas at high. Cook it that ways for 5-10 mins. In the meanwhile wash the baigans and slit them in a manner that there is a cross at the end. See the picture for better understanding. 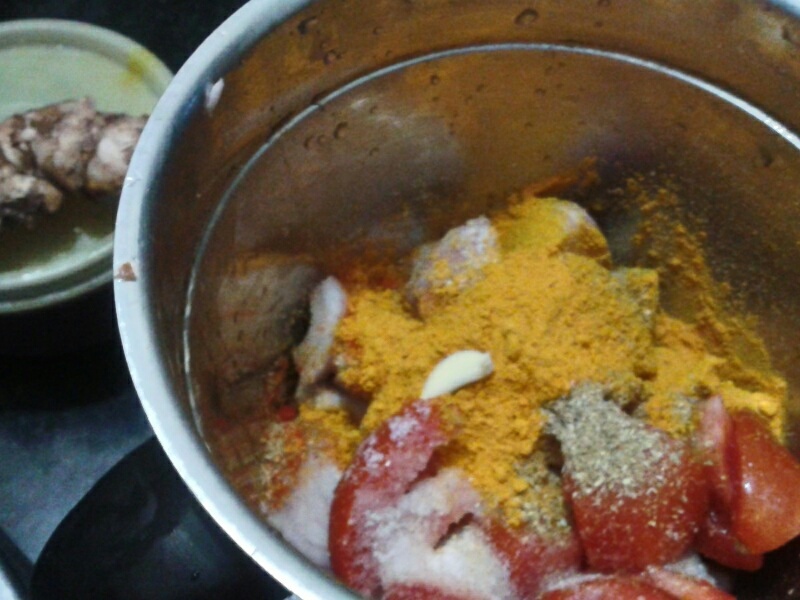 Once they are ready open the lid of the kadhai, stir the masala and add the baigans in it. Cover it again and put the gas at medium flame, keep stirring the masala every 5-20 minutes to ensure that it doesn’t stick to the vessel. Usually we first let the masala cook and then put the vegetables but in this case we put it all together because it speeds up the process. Add a little water if you feel that it is sticking to the vessel. The baigans will take some 15-20 minutes to cook and by that time even the masala would be cooked. When the oil separates from the masala, it is deemed to be cooked. Add a little water, garam masala, garnish it with cilantro leaves and serves it hot paratha’s and green chutney. Yay!!! First comment on my brand new blog!!!! Love the name of your new venture. 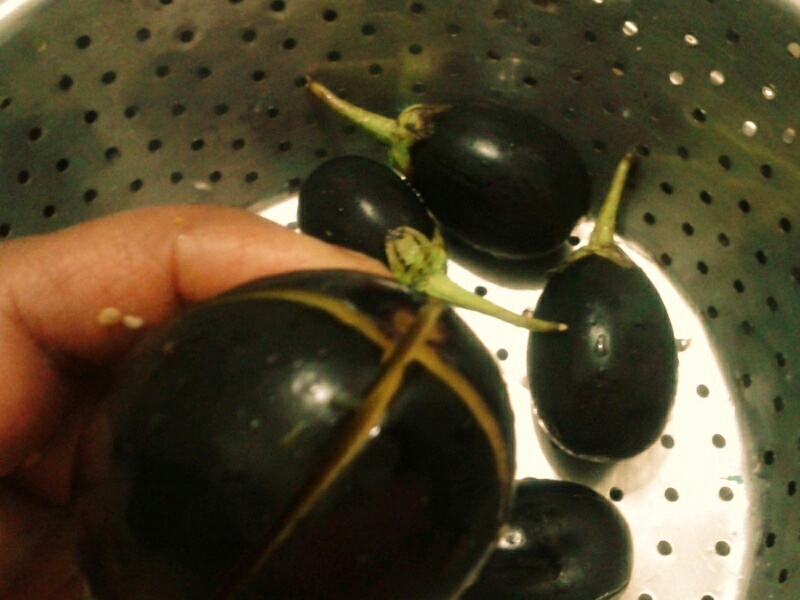 Not a fan of eggplant but the photos look yummy!! All the blog names looks to be inspired from Salman Khan movie name..
Baingain is one veggie I cannot get the kids to like so have to disguise it in a tomato sauce in a pasta dish. 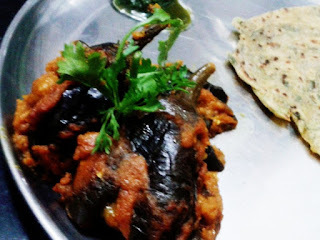 yet another way.. instead of stuffing, cook brinjal in masala.. end result looking like stuffed one.. nice method.. :). 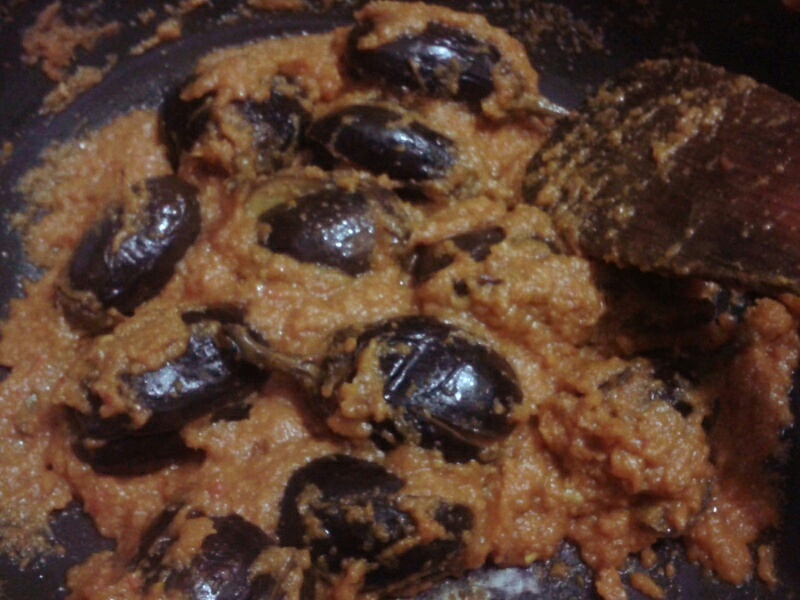 tried it.. but masala didn't get properly incorporated in brinjal.. they were left separate only.. any tips?? I love baingans and this is my absolute favorite.